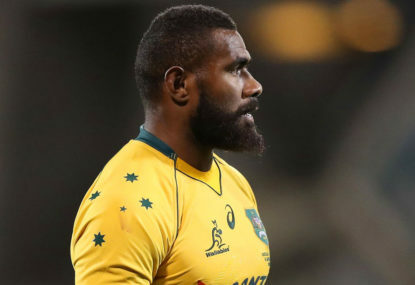 Ahead of the Rugby Championship, there are plenty of positions in Michael Cheika’s Wallabies side up for grabs, especially after the disappointing series loss to Ireland in June. That said, the hoodoo of Australian Super Rugby teams losing to our neighbours across the ditch was finally broken this year, with the Waratahs, Brumbies and Rebels getting up. Hopefully, we are able to carry some of that momentum into the Test series and take the Bledisloe back for the first time in 16 years. So what line-up should Cheika pick if he wants to beat the mighty All Blacks? Although he did not play the entire season for the Brumbies due to injury, Sio has good scrum technique at loose head and is not afraid of a fight. Paenga-Amosa is in due to Jordan Uelese having a knee reconstruction, and he’s a hard ball-runner with a good throw at the line out. Kepu is the Mr Consistent, week in week out he gives 100 per cent. Two of the toughest guys in the team, these tall timbers will throw their bodies on the line no matter the circumstance. Coleman had a great year in Melbourne as captain and will grow in his leadership role at the national level. These three make it more difficult for the line out, but they are the most in-form players. The Hooper and Pocock combo worked well in the June series and Samu, who is about to play for the Crusaders in the Super Rugby final this weekend, had a breakout year. Genia is coming back from a broken arm but, when in form, he is the prime halfback choice and can add some spark around the ruck – if he doesn’t do any box kicks. Foley is the inevitable choice at flyhalf, no doubt for that selection. After years of being in and out of the Wallabies squad, Beale has been in fine form this season for the Waratahs, having found is true position at inside centre. He can continue the growth of pairing with Foley. Although not playing at outside for the Rebels, Hodge is a utility who can play anywhere, and is a hard ball-runner with a big boot for good measure. These three played extremely well in the Super Rugby season. Koroibete is a human wrecking ball, Haylett-Petty a traditional winger and Folau is unstoppable in open space and great under the high ball. There are a few surprises, but this is the starting team that should do it.